The Disney touch was was unmistakeable and immediately I reached out to an old friend, Jeff Kober of the Disney Institute, who confirmed that indeed there was a Disney touch to this exhibit. The Houston Zoo had hired Rick Barongi, former Director of Animal Programs at Disney’s Animal Kingdom, as it’s new Director. Rick played a major role in the design, construction and opening of Disney’s Animal Kingdom and Disney’s Wildlife Conservation Fund. He brought his knowledge with him to the Houston Zoo and it is weaved wonderfully into the African Forest. Come join Gorilla Tommy as he enters the forest to catalog the animals he encounters and searches for the elusive Koolookamba. What’s a Koolookamba? In the 1800’s explorers in Africa reported sightings of a mysterious ape-like creature that resembled the cross between a chimpanzee and a gorilla. This mysterious animal, called the Koolookamba, has become the African equivalent of the Yeti or Bigfoot. The first sign of trouble is when you encounter Gorilla Tommy’s crashed airplane. He has turned it into a tent and if you read his journal entries you find that he has a broken leg and the indigenous pygmy tribe has taken him back to their village. You now enter the pygmy village (kid play zone) and learn more about their tribe. Go a bit further along the path and you will think you have arrived in an Africa village quite reminiscent of the fictional village of Harambe you have walked through at Disney’s Animal Kingdom. Here you will find a restaurant, restrooms, and a 4-D theater. After you leave the village you find yourself wandering down some paths that are extremely well themed. More rock formations are ahead, beautiful sounds of the drums are piped in (love this touch), and you find they are refurbishing for your future enjoyment with a new Gorilla exhibit. Probably one of my favorite things here is the assembly of drums to play. Remind you of the ones you find as you leave African and head to Asia in Disney’s Animal Kingdom? You turn the corner and you enter Gorilla Tommy’s tree house. Here you see where Gorilla Tommy lives, learn how he transitioned from capturing animals to becoming a conservationist, and get to enjoy the Chimpanzees. The details in this area are phenomenal. It really is the completion of a Disney story. 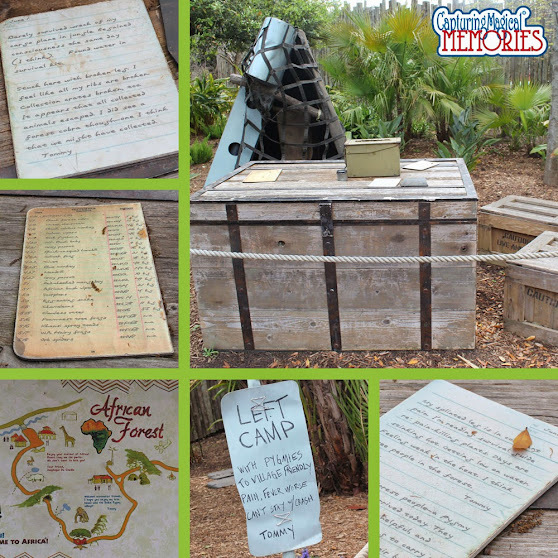 After you leave Gorilla Tommy’s tree house you are back on the savannah and you are surrounded by white rhinos, giraffe, ostrich, and kudu antelopes. There is also a Giraffe Feeding Platform where twice a day (11 am and 2 pm) visitors can feed a leafy snack to these long-necked creatures. And like any good attraction, you leave through a gift store. This is the just the first phase of the African Forest. In 2015, they will open a new gorilla habitat which also will house red river hogs. I love what the Houston Zoo has done and continues to do with this attraction. The Disney touch adds a touch of magic that makes it come alive. If you are ever in downtown Houston, the Houston Zoo is worth a stop. And make sure to come back on 2015 for the new Gorilla attraction. How cool! I love visiting the zoo and this is an added plus! It’s been so long since we’ve visited a zoo. I really think we need to get this on our summer to-do list! That is so fun! We have something similar (it is older though) at the Phoenix Zoo with our Bears. Wow that’s awesome and even more amazing that you both noticed it! My kids love the zoo, but if we’re ever in Houston, we’ll definitely have to check out this exhibit. Yes! I would definitely want to hang out at that zoo! It looks fantastic and like so much fun! My kids would love it too! They love the hands on exhibits. I went to the houston zoo a few years ago! its amazing! This would be so fun! This looks awesome! Love anything animal-related! Oh my goodness, this looks like soo much fun! I love Animal Kingdom so it looks like I need to make it out the Houston Zoo 😉 I’ve never been there! HouseholdHeroMC I agree! Leveraging Disney’s storytelling not only immerses you in the attraction but also is very educational. lamark Me too! I am a sucker for animals. And seeing them in something that more closely resembles their natural habitat is wonderful. ladyboarder9669 Then mark you calendar for 2015 for a return trip. I am thinking when the gorilla’s get here it will be amazing! I love going to the zoo. It is always so much fun. No way!!! I totally have to put this on my travel bucket list! The kids would LOVE it!